Summary : While this tea will not overwhelm anyone with its aroma or flavor, the mildly spicy cinnamon flavor with a hint of spearmint makes the tea enjoyable to drink. Review : I'll admit it, I'm a sucker for pretty packaging. And as such while tromping through Savemart the other night, the pretty packaging of the Christmas Eve Herbal Tea from Stash caught my attention. Since I had yet to review this tea, I tossed it in my grocery cart, brought it home and, after skimming over the ingredients in the tea, looked forward to giving this holiday tea from Stash a try. Here's how Stash descries their Christmas Eve Herbal Tea : Stash Premium Christmas Eve Herbal Tea is a delicious blend of mint and sweet spices, created to help you unwind and enjoy a moment of peaceful reflection. Light a fire and snuggle up with a warm and soothing cup of this caffeine free herbal tea. Created especially for the holidays, this festive herbal blend of mint and sweet spices brews a warm, soothing cup. Cinnamon imparts spicy, sweet flavor and aroma, orange peel adds a zesty citrus note, and Oregon spearmint adds cool, aromatic accents. Natural flavors of clove, vanilla and cinnamon create the finishing touch. 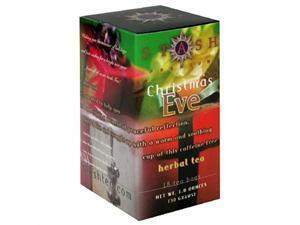 The Christmas Eve herbal tea from Stash contains the following ingredients : Cinnamon; Orange Peel; Spearmint; Natural Flavor of Vanilla; Orange Oil; Natural Flavor of Cinnamon; Natural Flavor of Clove. The aroma of the tea is weak, surprisingly weak considering the usual strong aroma found in teas that contain spearmint and cinnamon. However, there was a strong enough hint of cinnamon and spearmint in the teas aroma that I didn't let the weak fragrance get my spirits down. Once brewed, the tea has a pale yellow color, which I didn't find especially attractive since it reminded me far too much of what is handed over during a stop at your friendly local drug testing firm. Still, despite the unpleasant color, the cinnamon and spearmint in the ingredient list called me and I forced myself to take a hesitant sip. And much to my happiness, the tea itself is pretty good. While the flavor of the tea is rather weak, the cinnamon definitely adds a bit of spice to the tea. And the spearmint flavor is quite pronounced. All in all, I found the mix of ingredients used in this tea worked quite well once blended together. Overall, if you enjoy weaker flavored teas and enjoy the combination of cinnamon and spearmint, then you likely will enjoy this holiday tea from Stash Teas. As for me, I found the flavor a bit too weak to really enjoy the tea, and both the color and the lack of a pleasant and lingering aftertaste was also a turnoff. Recommendation : Yes. While I found nothing special about this tea, there's nothing bad about it either. For those in search of a weaker tasting cinnamon tea with a hint of spearmint and which lacks any sort of aftertaste, this tea will make for a pleasant drink. Brewing Instructions : Pour one cup (8 ounces) boiling water over the tea bag. Let steep for 3-5 minutes. Five minutes used for this review.